Quantification of the impact of free trade agreements (FTAs) has been a topic of significant interest among academics and policymakers for a long time (cf. Tinbergen 1962). Since 1986, there have been more than 350 new FTAs notified to the WTO, which have differed in terms of aim, breadth, and scope. Broadly speaking, these agreements have shared a common objective: to achieve deeper integration through lower tariffs, the elimination of non-tariff barriers, and the harmonisation of regulations. Given that non-tariff measures have become an increasingly important component of today’s FTAs, uncertainty surrounding how these provisions affect both the magnitude and direction of trade has clouded projections of the effects of future agreements and given ample fuel to political opposition, as the recent failure of the Trans-Pacific Partnership has emphatically shown. Can empirical research on past FTAs shed light on this uncertainty? To date, most studies that quantify the effects of trade agreements have either focused on obtaining a common average effect across all agreements (e.g. Baier and Bergstrand 2007, Anderson and Yotov 2016) or have assumed that the effects are common across similar types of agreements (e.g. Baier et al. 2014). A small literature, including works by Carrère (2006) and Kohl (2014), has documented that different individual FTAs – even ostensibly similar ones – can have very different effects on trade. However, while the principle that the effects of FTAs may be heterogeneous is generally well-understood, an intuitive understanding of the sources of this heterogeneity remains elusive. Aside from variation in tariffs, few theoretically grounded arguments exist for why one agreement should have a larger impact on trade than another, let alone why the same agreement might affect different members in different ways. Against this backdrop, in a recent paper we offer an ambitious study of the underlying determinants of heterogeneity in FTAs effects (Baier et al. 2016). Contributing to the existing empirical and theoretical literature on trade agreements, we construct novel, theoretically motivated indices that are shown to be empirically relevant for explaining not only why some agreements have been more successful than others at creating trade – that is, across-agreement heterogeneity – but also how they may have asymmetric effects on exports versus imports for different members – i.e. within-agreement heterogeneity. This topic, despite its intuitive appeal, has not received much attention in the empirical literature. We use data on trade and production in manufacturing for a sample of 70 countries over the 20-year period from 1986 to 2006. Our data include large trading countries like the US and EU member states, as well as smaller countries like Cyprus, Iceland, and Jordan. The data also cover important agreements such as the North American Free Trade Agreement (NAFTA), the Association of South East Asian Nations (ASEAN), and several EU accession agreements. In a preliminary analysis, which demonstrates the presence of across-agreement heterogeneity, we quantify the average effects of each agreement. As in other studies, we do indeed find a fair amount of heterogeneity across the different agreements. Going a step further, however, we then allow for bilateral heterogeneity within agreements; for example, for the case of EU accessions, the implications for trade between Hungary and Poland may be quite different than for trade between Portugal and Sweden. Figure 1 offers a graphical depiction of the rich heterogeneity that occurs within agreements, showing how different pairs of countries may be affected very differently by the same agreement. 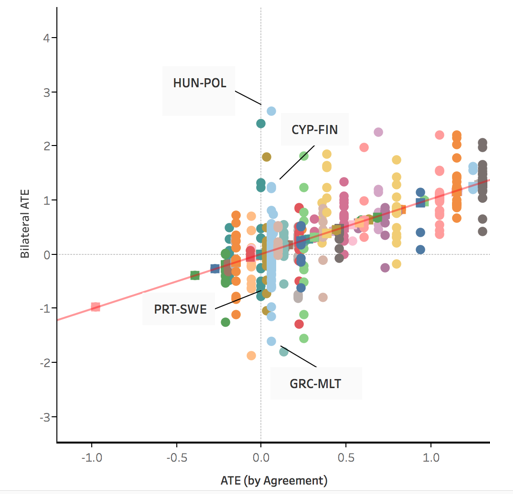 In the figure, the average treatment effect of the overall agreement is on the horizontal axis, each colour represents a different agreement, and the vertical axis is the bilateral specific effect of the agreement. Digging deeper still, we go on to quantify the directional (i.e. asymmetric) impact of each agreement; that is, within each agreement, the measured impact of the agreement may affect bilateral exports from, say, Ecuador to Colombia very differently than exports from Colombia to Ecuador. 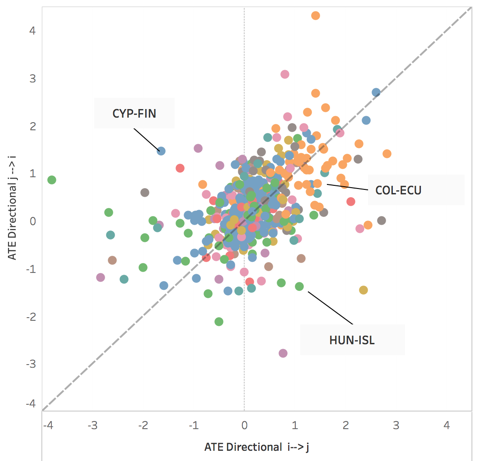 Figure 2 depicts the measured directional heterogeneity within agreements. As before, the colours represent an agreement. The horizontal axis measures the effect of each agreement on trade flowing from country i to country j and the vertical axis depicts the measured effect of the same agreement on exports from j to i. While the directional effects are positively correlated as expected, we document a great deal of within-agreement and directional heterogeneity. For example, within the EFTA-Hungary agreement signed in 1993, the measured directional impact of the agreement on Hungary-Iceland (HUN-ISL) trade was a doubling of exports from Hungary to Iceland specifically, compared with a 75% decrease in exports headed in the other direction. Another example of the asymmetric effects is the EU-Cyprus agreement signed in 1988 where Cyprus’ exports to Finland increased dramatically and Finland’s exports to Cyprus fell by nearly 75%. For the Andean Community, Colombia exports to and imports from Ecuador increased, but Colombia’s exports to Ecuador increase by more than 300% while Ecuador’s exports to Colombia increased by slightly more than 100%. Using a simple variance decomposition, we find that roughly one-third of the variation of the FTA effects are accounted for by variation across agreements; the remaining two-thirds of the measured variation are accounted for by the variation within the agreements. With these estimates in hand, we then turn to a ‘second stage’ of our analysis intended to shed light on the underlying determinants of the variance in FTA effects that we observe. In this second stage, the direction-specific FTA estimates from our first stage now serve as our dependent variable, affording us the flexibility to consider a wide range of different institutional and/or geographic factors as potential explanatory variables. Pre-FTA trade barriers. We find a positive correlation between the bilateral level of ex-ante trade frictions, obtained as a by-product of our first stage estimates, and the measured impact of trade agreements ex-post. Intuitively, the presence of higher trade frictions ex-ante indicates a larger scope for trade creation ex-post. Revealed market power and terms of trade. Following the theoretical literature on trade agreements, we construct a measure of market power to assess how the efficacy of the FTAs varies with the market power of each country. Theory (e.g. Bagwell and Staiger 1999, 2004) indicates that countries with less market power in world markets should receive larger concessions from trade agreements, because their trade policies are already likely to be close to their internal optimal levels. The empirical findings support the idea that lower market power is associated with greater concessions, which here helps predict asymmetric changes in trade following an agreement. New goods margin. It has been hypothesised that bilateral pairs that trade over a smaller range of goods before the agreement have more room for trade growth on the extensive margin following the signing of a trade agreement. Therefore, in some of our specifications we include Hummels and Klenow’s (2005) measure for the extensive margin of trade (using the ‘least traded goods’ definition of the extensive margin used by Kehoe and Ruhl 2013). The role of the extensive margin appears to vary within versus across agreements. Within the same agreement, export growth does tend to be relatively larger for exporters that start from a narrower range of traded goods. Across agreements, however, it is not generally the case that agreements between countries who trade fewer goods ex ante have larger trade creation effects ex post. In addition to these indices, we also take the opportunity to include controls for a host of other economic, geographic, and institutional factors that might help explain the effects of FTAs. These, too, help reveal some insights of note. For example, similar to the findings in Baier et al. (2017), we find that distance is an important factor in accounting for the heterogeneous impact of trade agreements – the more distant two countries are, the less trade is created. Other standard ‘gravity’ controls such as GDP, GDP per capita, and the presence of a colonial relationship are also considered. Among these variables, the most notable findings are that the economic size of the importers and exporters – measured by log GDP – are positively associated with ex post trade creation effects and that countries with lower GDP per capita tend to enjoy relatively more export growth, even after controlling for differences in size and market power. We also explore whether differences in institutions and/or physical and human capital endowments can help to account for some of the measured variability in FTA estimates. Generally speaking, countries with stronger institutional indicators –covering the degree of democracy, the strength of rule of law, and the presence of checks and balances – tend to be associated with stronger trade creation. Finally, in terms of factor endowments, physical capital shows no robust correlation with the efficacy of the trade agreements in our sample, while exporter human capital abundance exhibits a positive correlation. However, we generally find that institutional and factor endowment-related indicators are only relevant for explaining across-agreement heterogeneity as opposed to within-agreement heterogeneity. Anderson, J E and Y V Yotov (2016), "Terms of trade and global efficiency effects of free trade agreements, 1990–2002", Journal of International Economics 99(C): 279-298. Bagwell, K and R W Staiger (1999), “An economic theory of GATT”, American Economic Review 89(1): 215–248. Bagwell, K and R W Staiger (2004), “Multilateral trade negotiations, bilateral opportunism and the rules of GATT/WTO”, Journal of International Economics 63(1): 1–29. Baier, S L and J H Bergstrand (2007), “Do free trade agreements actually increase members’ international trade?”, Journal of International Economics 71(1): 72–95. Baier, S L, J H Bergstrand and M Clance (2017), “Heterogeneous economic integration agreements”, mimeo. Baier, S L, J H Bergstrand and M Feng (2014) “Economic integration agreements and the margins of international trade”, Journal of International Economics 93(2): 339–350. Baier, S,Y Yotov and T Zylkin (2016), "On the widely differing effects of free trade agreements: Lessons from twenty years of trade integration," School of Economics Working Paper Series 2016-15, LeBow College of Business, Drexel University. Carrère, C (2006), “Revisiting the effects of regional trade agreements on trade flows with proper specification of the gravity model”, European Economic Review 50(2): 223–247. Hummels, D and P J Klenow (2005), “The variety and quality of a nation’s exports”, American Economic Review 95(3): 704–723. Kehoe, T J and K J Ruhl (2013), “How important is the new goods margin in international trade?”, Journal of Political Economy 121(2): 358–392. Kohl, T (2014), “Do we really know that trade agreements increase trade?”, Review of World Economics 150(3): 443–469. Tinbergen, J (1962), “An analysis of world trade flows”, in Shaping the World Economy, New York, Twentieth Century Fund: 1–117.